جزء من an Ordnance Survey map, published 1952. The grid lines are at one kilometre intervals giving each square an area of one square kilometre. The map shows that the area of the island is about two square kilometres. Topographical map grids are worked out in metres, with the grid lines being 1,000 metres apart. 1:100,000 maps are divided into squares representing 1 km2, each square on the map being one square centimetre in area and representing 1 km2 on the surface of the earth. For 1:50,000 maps, the grid lines are 2 cm apart. Each square on the map is 2 cm by 2 cm (4 cm2) and represents 1 km2 on the surface of the earth. For 1:25,000 maps, the grid lines are 4 cm apart. Each square on the map is 4 cm by 4 cm (16 cm2) and represents 1 km2 on the surface of the earth. In each case, the grid lines enclose one square kilometre. 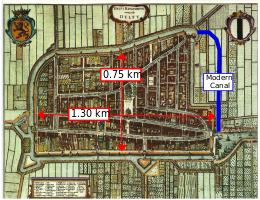 The walled city of Delft was approximately rectangular. The approximate length of rectangle was about 1.30 kilometres (0.81 mi). The approximate width of the rectangle was about 0.75 kilometres (0.47 mi). The medieval city is roughly rectangular with rounded north-east and north-west corners. The maximum distance from east to west is 1.36 kilometres (0.85 mi). The maximum distance from north to south is 0.80 kilometres (0.50 mi). A perfect rectangle of these dimensions would be 1.36×0.80 = 1.088 km2. مدينة بروگه القروسطية، المركز الكبير في الفلاندرز, was roughly oval or ellipsoidal in shape with the longer or semi-major axis running north and south. The maximum distance from north to south (semi-major axis) is 2.53 kilometres (1.57 mi). The maximum distance from east to west (semi-minor axis) is 1.81 kilometres (1.12 mi). A perfect ellipse of these dimensions would be 2.53 × 1.81 × (π/4) = 3.597 km2. Chester is one of the smaller English cities that has a near-intact city wall. The distance from Northgate to Watergate is about 855 metres. The distance from Eastgate to Westgate is about 589 metres. A perfect rectangle of these dimensions would be (855/1000) × (589/1000) = 0.504 km2. Jones County Central Park, Iowa, USA. Sydney Olympic Park, Sydney, Australia, contains 1 square kilometre of wetlands and waterways. SI prefix for the precise meaning of the prefix "k"
^ Howe, Steve. "Chester: A Virtual Stroll around the Walls". Retrieved 7 October 2012. ^ "Medway Council Riverside Country Park". web page. Medway Council. 2012. Retrieved 9 June 2012. ^ "Ashfield Brierley Forest Park". web page. Ashfield District Council. 2012. Retrieved 9 June 2012. ^ "California Department of Parks and Recreation Rio de Los Angeles State Park". web page. State of California. 2012. Retrieved 9 June 2012. ^ "Parks & Recreation Central Park, Center Junction, Iowa". web page. Jones County Tourism Association. Retrieved 9 June 2012. ^ "A History of Kiest Park". web page. Friends of Oak Cliff Parks. 2010. Retrieved 9 June 2012. ^ "Hole-in-the-Wall Park & Campground". web page. Hole-in-the-Wall Park & Campground. 2012. Retrieved 9 June 2012. ^ "BC Parks Downing Provincial Park". web page. British Columbia Ministry of Environment. Retrieved 9 June 2012. ^ "Citadel Park". web page. Poland Travel. Retrieved 9 June 2012. ^ "Sydney Olympic Park Parklands Fact Sheet". web page. Sydney Olympic Park Authority. Retrieved 9 June 2012.